York Art Association April show: The Life of Trees and Botanicals, with Featured Artist Rowland Bryant. Come see the collection of Rowland?s prized works. Trees and other botanicals play a deep and very important role in our every day lives, whether you are aware of their impact or not. They have been an integral subject in artwork as long as artwork has been around. This exhibit explores the usage of and a deeper look at trees and botanicals as a subject. Member artists dive deep into texture, color and contrast, the cycles of the seasons; both macro and micro explorations and how we interact with it all in our lives. Rowland Bryant, a recent transplant to York from the amazing Hudson Valley in New York, currently lives with his girlfriend and their rescue Yorkie and Silky Terrier dogs. Born in Woodbury, New Jersey, across the river from Philadelphia, Rowland started painting at age 12 and did numerous portraits in Wildwood, NJ. After working as an electrician on submarines for 20 years, Rowland left the profession to purchase, renovate and operate the Iran Allen House Bed & Breakfast in Sutherland, Vermont for 10 years. While there he honed his culinary skills, treating his guests to his tasty creations. Rowland bounced from Vermont to Cambridge, NY then to Saugerties, NY before finally landing here in York, painting all along the way. 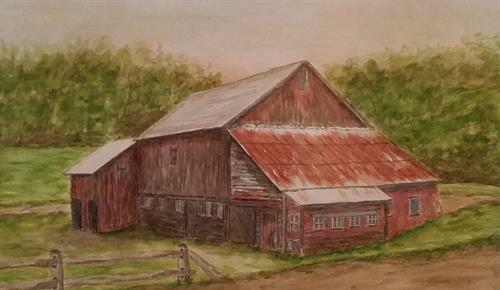 York Art Association is a member gallery striving to empower local artists, performers and exhibitors to showcase their work. The York Art Association values, promotes and supports the visual, performing and literary arts by providing programs and events for the benefit of its members and the community. The vision of the York Art Association is to be a vibrant organization that cultivates the arts for the greater York community.